The hardware and software reference design includes a multi-touch touch-pad, 6-axis motion sensing, and full QWERTY keyboard. The reference design contains a multi-protocol nRF51822 System on Chip (SoC) to offer simultaneous single chip Bluetooth low energy and a 2.4GHz proprietary RF protocol support. It also provides a unique, feature-rich platform for developing remote controls for digital TVs and set-top boxes. Application examples include audio, video, gaming, web browsing, social media, and online shopping. 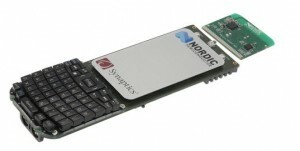 The nRF51822 multi-protocol SoC allows remote control producers to bring products to market that can simultaneously and adaptively support Bluetooth Low Energy (via the HID over GATT profile) and proprietary 2.4GHz wireless technology in the same product form factor, using identical data formats over the wireless link to minimize design complexity, and without requiring any firmware changes. This offers developers a high level of commercial protection against future consumer technology trends by allowing them to offer a maximum range of alternative options to their customers. The nRF51822 SoC also offer a class-leading RF performance, ultra low power consumption, and excellent cost efficiencies. The design even contains an IR (Infrared) LED that can be used to add support for legacy IR-controlled equipment too. The kit includes a remote baseboard, nRF51822 radio module, 2.4GHz RF USB dongle, Bluetooth 4.0 USB dongle, programming adapter plus a complete set of design files, software source code, and supporting documentation.